In the past 50 y, there has been a decline in average sleep duration and quality, with adverse consequences on general health. A representative survey of 1,508 American adults recently revealed that 90% of Americans used some type of electronics at least a few nights per week within 1 h before bedtime. Mounting evidence from countries around the world shows the negative impact of such technology use on sleep. This negative impact on sleep may be due to the short-wavelength–enriched light emitted by these electronic devices, given that artificial-light exposure has been shown experimentally to produce alerting effects, suppress melatonin, and phase-shift the biological clock. A few reports have shown that these devices suppress melatonin levels, but little is known about the effects on circadian phase or the following sleep episode, exposing a substantial gap in our knowledge of how this increasingly popular technology affects sleep. 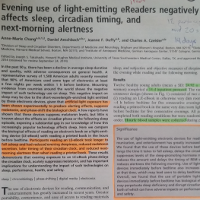 Here we compare the biological effects of reading an electronic book on a light-emitting device (LE-eBook) with reading a printed book in the hours before bedtime. Participants reading an LE-eBook took longer to fall asleep and had reduced evening sleepiness, reduced melatonin secretion, later timing of their circadian clock, and reduced next-morning alertness than when reading a printed book. These results demonstrate that evening exposure to an LE-eBook phase-delays the circadian clock, acutely suppresses melatonin, and has important implications for understanding the impact of such technologies on sleep, performance, health, and safety.